Editor’s note: This is a guest post from MBP.com. Sony released their Sony A7RII in 2015 and it quickly became the brand’s flagship camera model, earning the mantle of “Best Product of 2015,” awarded by DPReview! And rightly so. With its 42MP sensor, built-in image stabilization, 4K video capabilities and max ISO of 102,400, the A7RIIappealed to photo-enthusiasts at all levels—both those used to Sony’s mirrorless Alpha line and those who might be on the verge of ditching their DSLR for the smaller, lighter system. However, it wasn’t without its drawbacks. For instance, battery life on the A7RII paled in comparison to flagship options from competitors like Nikon and Canon. Many shooters who use the camera (myself included) have reported that they need to pack three or four batteries with them when going on shoots that last more than a few hours. Additionally, the camera seemed to miss the mark on some hardware features that its competitors were able to deliver on, such as dual SD slots, a touchscreen, and a multi-use joystick. Not to mention, upon its release, the camera came with a $3,200 price tag! Even so, these factors did not stop the camera from gaining worldwide popularity within the photo community. Then, something amazing happened… Sony dropped the A9. A $5,000 machine of pure photographic force (as far as hardware AND software goes), the A9 left many photo-folk gawking. However, the price tag alone was enough for people to wait for Sony’s next camera in the A7 line. And then it came: Sony announced the A7RIII in October of 2017, and along with it a gang of sought-after upgrades—some noticeable, and some not so much. Here are a few that stood out to us. Sony has made the Eye AF twice as fast on the A7RIII. The same treatment has been given to the standard face detection focus, which we found works even better in low light on the A7RIII than it did on its predecessor. Oh, and did we mention that the newest camera in the A7 series can shoot 10fps? This is doubled compared to 5fps on the A7RII. What does this mean? It means that when using continuous shooting mode on the A7RIII, 10fps will give you 87 compressed raw files and/or JPEGs, or 28 uncompressed raw files. That’s fast. Not quite as fast as the A9, but faster than most people will need. The sensor on the A7RIII has been updated to allow for even better image quality. However, it still stands at a cool 42-megapixels, so one should expect there to be a noticeable buffer time when shooting continuously. That being said, the wait time when buffering multiple shots has been cut down significantly. In addition, the A7RIII now allows you to access the menu while waiting for the buffer to finish playing catch-up, which is a small victory. One of the biggest gripes with the Sony Alpha cameras (until recently) has been the poor battery life offered by the NP-FW50 battery. Sony appears to have finally listened to the cries of many, as they have completely scrapped that wishy-washy old battery and substituted it for the larger NP-FZ100 model. Sony is reporting that this change has doubled the amount of life the Sony A7RIII will have before that dreaded “battery exhausted” message pops up on screen. The updated battery can sustain 530 shots when using the LCD, or 650 shots using the viewfinder; both figures up drastically compared with the model A7RII, which only offered 290 shots (LCD) and 340 shots (EVF). At long last, Sony has delivered a camera with professional quality battery life, putting DSLRs under a bit of pressure! The inclusion of a bigger battery means the hand grip on the A7RIII has a bit more heft to it when compared to its predecessor. This results in the camera feeling much “fuller” in the hands, giving it a professional feel that many mirrorless skeptics say the new-age cameras often lack. 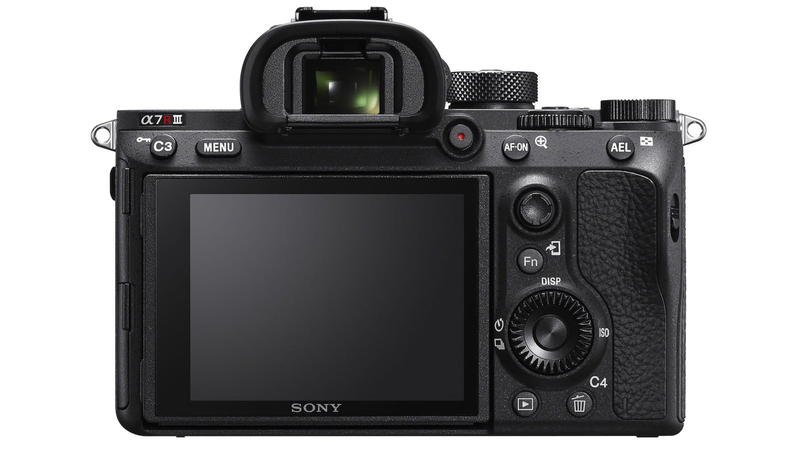 Additionally, the A7RIII—like the A9—has a multi-selector joystick that can be used for menu controls as well as focal point selection. A massive upgrade compared to the standard d-pad on the A7RII, Sony appears to be streamlining its Alpha line, taking key components from the pricey A9 and slapping them on its prosumer offerings. Whether you’re picking your focus point, or want to easily move around 100% of a photo when zoomed, the joystick is a welcome addition. A massive selling point for me (in the hardware realm) is the inclusion of a dual SD card slot. This allows for flexible file saving and handling, and can even be configured to partition raw and JPEG files. One of the card slots is rated to support UHS-II memory cards too. Sony has done it again. They’ve blessed us with an entirely new entry point into the world of mirrorless photography. The Sony A7RIII is a unique blend of features and power, pulling from both the A9 and the A7RII to give us the best of both. Will you be investing in Sony’s newest flagship camera? Or are there still some features lacking for you? Drop a comment and let us know your thoughts!